Non-Gun DIY Projects and Customizations This section is for your DIY spearfishing projects and customization other then spearguns. How does everyone attach their polypro to their gun and or float? What size and strength do you use? Im considering trying to make a line to use for Pargo in Baja coming up at the start of November. A couple threads have suggested the use of polypro and so Im looking forward to seeing and hearing how everyone sets it up with their system. I'm not sure what kind of conditions in Baja, but I made an el cheapo setup and am going to order a reef hook to tag spots for my float. The line I have is 195lb test 3/8" braided poly and will accept a tuna clip on the end. On the DIY float pictured above I have two stainless steel washers on each end to keep the line in place. Definitely not for big fish though..I just made this to mark spots where I find lobsters or caves I wanna check out. I did see somewhere online where people use braided paracord (550 cord) and pvc tubing over the cord tied to swivels (heat shrink?) + tuna clips..
Im basically looking for a durable rope that I can simply/cheaply find a way to attach to a gun/float in a heavy duty way. I dont want or need to modify the cord in anyway to make it into more of a floatline, I just want reliable attachment points so that I know a big fish isnt going to pull the gun free of the line etc. What kind of gun/attachment at the gun do you have? As long as that's strong, (I use a loop of Dynema pinned into my wooden handle), you should be good using a stainless shackle from Neptonics. Also, if you are using a twisted line, you can splice a loop at each end of the line, with (or without) a stainless eye in each spliced loop. At the float, you can use another stainless shackle to connect to whatever attachment point you have on your float. I had a lot of twisted line, so I spliced a stainless ring from the hardware store into the end of a short line going through my crab float and I use a shackle to hook my line to that. I second this. since I'm using diamond braid poly for the end if I'm lazy I do a double overhand knot on the end that connects to the gun/spear/reef, and depending on my connection either using a 400lb SS tuna clip tied to the gun's handle with dyneema, a stainless d ring, or a reef hook (hopefully diy or ordering soon). Should handle fish up to 20lbs easy if it's a good shot. We call it blue steel, not to be confused with Amsteel Blue 12 strand spectra. This stuff is poly . Used all the time in commercial fishing applications . I bought a 600' shot of it for like 70$ a couple of years ago. If I'm diving an area where big fish are likely to drag it under ledges /through sharp structure . This what I use. The long line clips with built in swivels are like 2.50 $ a piece . In for the floatline tips too. Cool stuff.. might pick some up to try. I'd like to know what everyone here is using for shooting line, if you're wanting reef-proof/ abrasion resistant float lines? I've flooded/torn one PVC floatline already.. looking for something more durable myself. Yep. 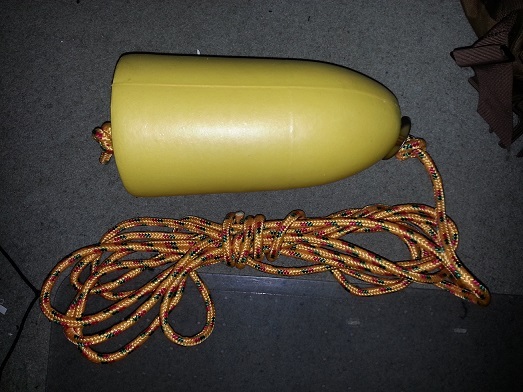 That foam filled poly line with swivel tuna clips and a bullet shaped lobster float. Bomb proof floatline setup. I've taken many (and I mean MANY) wahoos with it. For reef is perfect as the rope floats a lot and withstand abrasion very well and the float will never puncture. Last edited by ny_er; 11-23-2015 at 03:20 PM. Just ordered and received my Blue steel line from Cwestern. Thanks for the link. It was $45 for 600 feet, but add $20 for shipping, still a great price. Haven't had a chance to use it but it looks like the way to go, 3100 lbs of tensile strength wow. Now I have to decide on a float. First time working with this kinda rope for myself. It was fun and easy to splice. Will give it a try in Baja this March. First non- vinyl float line for me.